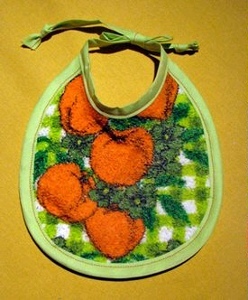 Spring and Summer are the times for a lot of baby shower and babies to be born; so, here are a few projects you can sew for gifts. 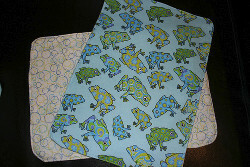 Materials: 1/2 yard of two different fabrics for each set of burp cloths. This allows for a contrasting fabric on the back. 1 yard of fabric makes 4 burp cloths. Iron your 1/2 yard of fabric (to get out all the creases) and fold it into fourths. Cut through all four layers a 10" x 14" rectangle. Repeat steps 1 & 2 for the second 1/2 yard of fabric. You'll now have 8 rectangles to make 4 burp cloths. Sew 1/4" around the edges, leaving an opening on one side to turn it right side out. Turn right side out. Iron edges flat, turning opening inward. Begin by laundering your towels if you've purchased thrift store ones. Cut your towels down to about 9in. x 9in square. My towels had crocheted tops which I just cut off and then trimmed to 9in x 9in. Print out the bib template and cut it out. If your towel is very bright turn it to the wrong side to trace the pattern so you can easily see your line. Pin the bias tape around the edges of the bib, beginning on the right side and ending on the left not continuing across the top. Make sure the shorter side of the bias tape is on the front side of the bib so that when you sew you catch all of the tape. Use lots of pins so that the tape lays nice and flat with no puckers. Sew the bias tape using a 1/16 inch seam allowance making sure you're catching both sides of the tape. Trim the ends of the bias tape even with the bib. Cut a pieces of bias tape 26 inches long and centering the length along the center of the bib pin it in place. Again, use lots of pins to make sure it's nice and smooth. Starting at one end of the bias tape and using a 1/16 inch seam allowance sew the bias tape closed, continue across the tope of the bib and then along the other end of the bias tape. Put a small knot in both ends and you're done! If you wish you can iron your bib to make the bias tape lay a little flatter. If either of your fabrics is wrinkly you will need to iron them before you start sewing. You may even want to go as far as washing the fabrics too. Be very careful when it comes to washing the fleece/faux fur fabric as some of them are very sensitive to drier heat. Place your fabrics together so they are facing in towards each other (right sides in). Make a baby blanket The backside of each fabric should be facing outwards. Place them so that their corners and straight edges are aligned as straight as possible. Now lay them across a flat table, workspace, or even the floor. You do not need a pattern to measure and cut out your fabric. You can simply use a ruler and measure the fabric to cut. Or use a spare receiving blanket, or even a newspaper unfolded all the way. A newspaper works quite well, and it is what I used to make these blankets. Lay the newspaper (or whatever you decide to use as a "pattern") over the fabric so that it is also aligned to one corner and then pin it down. Use a good sharp pair or fabric shears to cut the fabric around your make-shift pattern (as in the example shown to the right). Once you have your fabrics cut to size remove the pins one by one and replace them to their original spot removing the newspaper (or whatever material you used as a pattern). Start Sewing! Pick a thread that coordinates with or matches your fabric colors. Starting from one corner sew the first three edges. Sew about a 1/4 to a 1/2 in in from the edge. Really just sew in as far as you feel comfortable sewing. 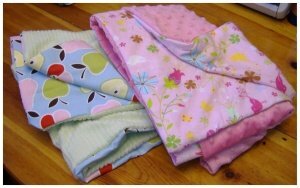 Try to sewing a baby blanket to stay consistent around all four edges of the baby blanket. When you reach the fourth edge sew this side only about 3/4's of the way. Use a back stitch just before you end. You will need to keep an opening in the fabric so that you can fold the blanket inside out. Pull the blanket inside out. Pay special attention to the corners to pull them out straight. You can use a tool or a popsicle stick, or whatever is handy, to push the corners out as straight as you can get them. Sew the opening in the fabric shut. To do this, fold the rough edges inward to match the rest of the seams. Pin these shut. Now get out a sewing needle to hand sew the opening shut. Thread the needle with the same thread you used in the sewing machine. Use very small stitches hidden in the seamm as best as you can. Finish by stitching 2 or 3 stitches over each other to keep it stitched firmly closed. Iron the blanket at all of the edges. You can use it as is or go back and sew another seam about 1/2" in from the outer edge of the blanket. I like to do this using a decorative stitch, or zigzag, and using a brightly colored coordinating thread. It adds a nice decorative interest and a finished look. seam about 1/2" in from the outer edge of the blanket. I like to do this using a decorative stitch, or zigzag, and using a brightly colored coordinating thread. It adds a nice decorative interest and a finished look.